This is possibly one of the craziest stories of 2018. 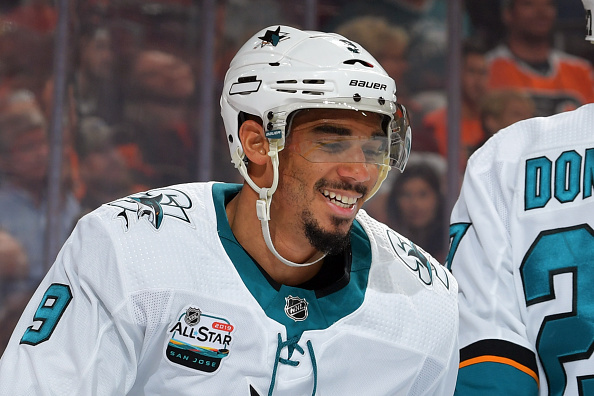 Back in October, it was reported that the San Jose Sharks star was being sued by a woman who claims to have been his side-chick, not because he hurt her physically in anyway, but because he never came through on a payment for aborting his children. The unidentified woman says she never planned on aborting the 3rd child until Kane promised to give her $3 million to do so,but once she did, the money was nowhere to be found. Now,Kane is demanding that her identity be revealed to the world. The accuser filed a lawsuit against Kane claiming she’s been dating the 27-year-old on-and-off since 2015 and had 2 abortions during their relationship. But, in May 2018, the woman claims she got pregnant for the 3rd time — but decided she wanted to keep the baby. It wasn’t until Kane offered a $3 million check that she agreed to terminate. In her suit, Doe claims she went through with the procedure but Kane never ponied up the dough — so she sued. Kane has previously denied the allegations — and now he’s filed new legal docs asking the judge to throw out the case. In his papers, Kane argues that even if he did agree to the $3 million deal, it was made in a private, consensual sexual setting and the court has no authority to enforce it. He also argues that since he’s not accused of committing a crime, the accuser should not be able to hide behind an alias — and if the case moves forward, she should use her real name instead of Jane Doe. The 27-year-old recently signed a 7-year, $49 million contract extension.